Yesterday we had the most amazing cooler weather, but it was a bit windy. Nonetheless I enjoyed sitting outside on my deck after finally cleaning the windows out there that I could reach. I love being outside when it isn't blazing hot and thick with humidity. 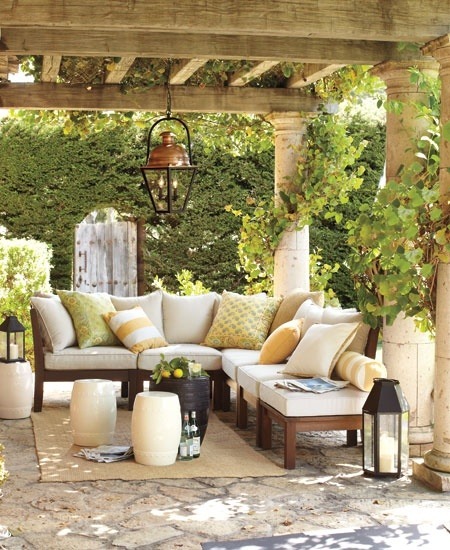 So today what I'm loving is outdoor spaces. This was our deck two years ago after we remodeled it. This year's deck is a bit different and will be shared soon. This weekend unofficially marks the beginning of summer. I hope y'all make the best of it! I love your renovated deck and the inspiration photos are great! Hopefully, we will get our deck ready this weekend. Have a great weekend! 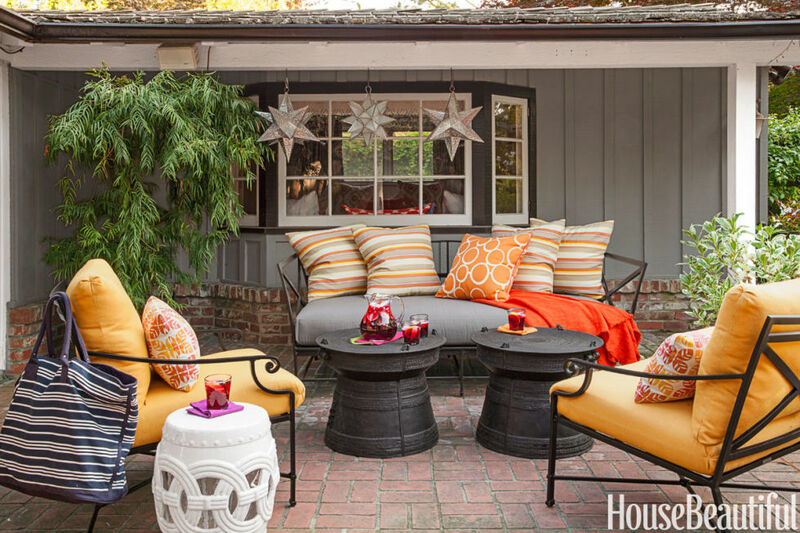 That is such a pretty sitting area. I can't imagine how you could improve it! Great inspiration photos! We are outside every.single.day unless the weather is bad. I can't stand to stay cooped up inside! Thankfully our patio gets shady by a certain time of day (and we put up a pergola with shade top this year) and the front porch is nice most of the day. I just realized the other day there is a great shady spot way in the back that I need to put a couple of comfy loungers! Pollen is still in the air here, so no window washing yet - but my hubby is the window washer! Great inspiration pics. Love your deck, it looks so inviting. 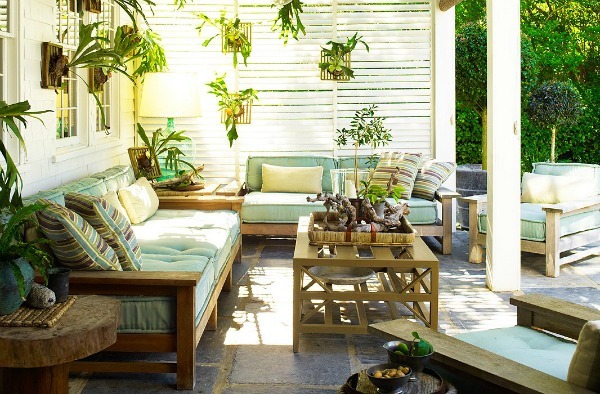 I remember your remodeled deck post- I love the pretty fabrics used for the pillows and the pouf (or is it an ottoman?). 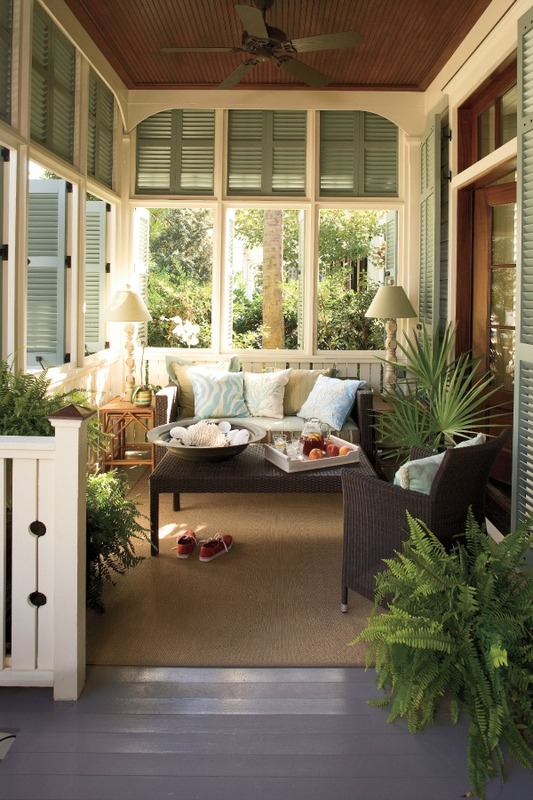 I really love the Southern Living outdoor room too- wonderful! Those are great inspiration pictures! Looking forward to seeing your deck décor. That fireplace has me hoping that fire pit weather will be here soon. I love the outdoors. Your deck is lovely. I am still working on mine. The petunias are beautiful this year. Hope you have a great weekend. I hope you can spend some recuperation time on your beautiful deck in-between the rains!! Have a great weekend!